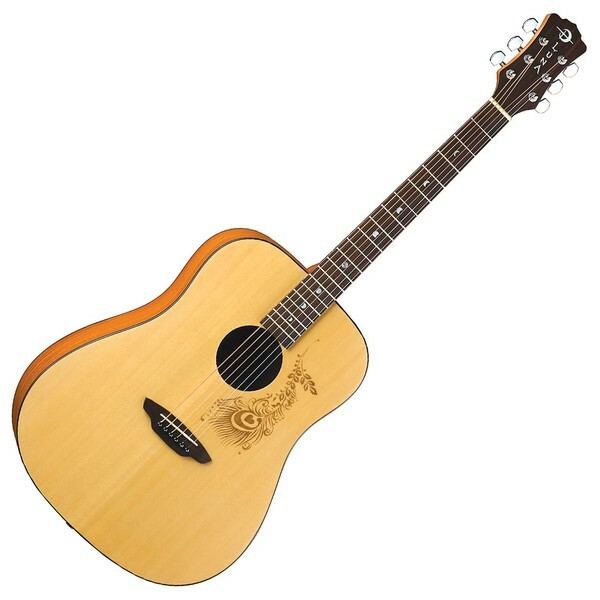 The Luna Gypsy Henna Dreadnought Acoustic Guitar features a select spruce and mahogany construction which provides the Gypsy Henna with a broad dynamic range, and a rich, full bodied tone that offers a resonant, sonically pleasing experience. The Gypsy Henna also features a dreadnought body shape which provides a rich, deep tone that can handle numerous techniques and genres with ease. Its select spruce top is complemented by a subtle yet beautiful laser etched henna design, and its smooth playing rosewood fingerboard is sprinkled with Luna's exclusive moon phase markers, inlaid in mother of pearl for added beauty. This affordable, classic dreadnought guitar, blended with a hint of Luna's creative personality will sit unobtrusively in any home. The Gypsy Henna features a select spruce top that yields crisp articulation and delivers a broad dynamic range. Spruce is commonly used to build guitar tops, as the wood generates a versatile tonal character that responds greatly to both light fingerpicking techniques to heavier strumming. The wood itself is quite elastic in nature which resonates well whilst remaining strong, and provides a focused, clear sound of deep lows, a warm mid-range, and bright sparkling highs. Its brightly toned spruce top is coupled with mahogany back and sides which produces a meaty mid-range, punchy, woody tones, as well as a rich, dark, and resonant tone. 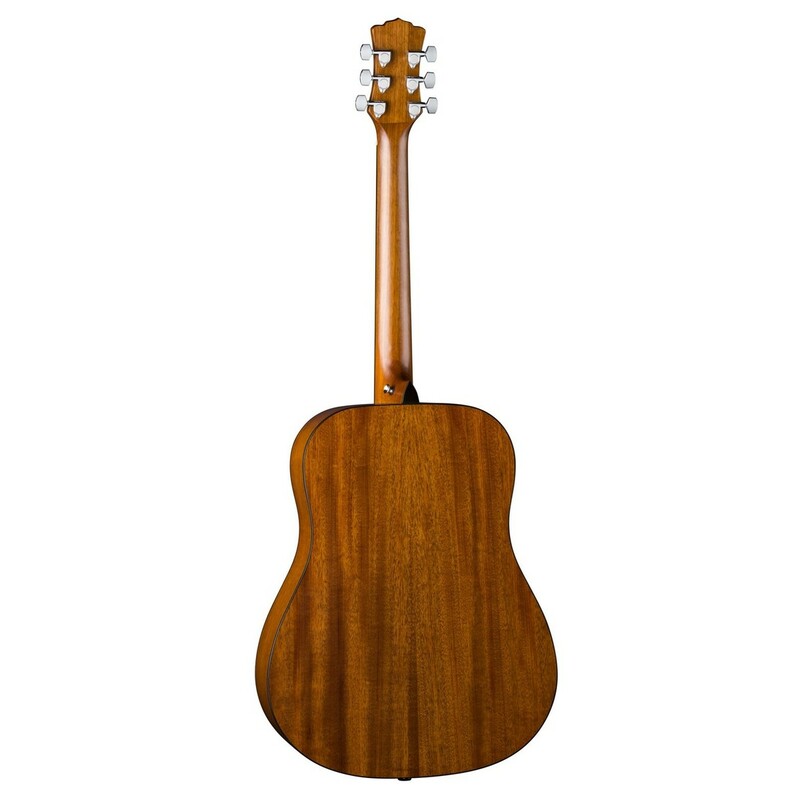 Constructed from mahogany, the Henna's neck offers great durability and resonance. 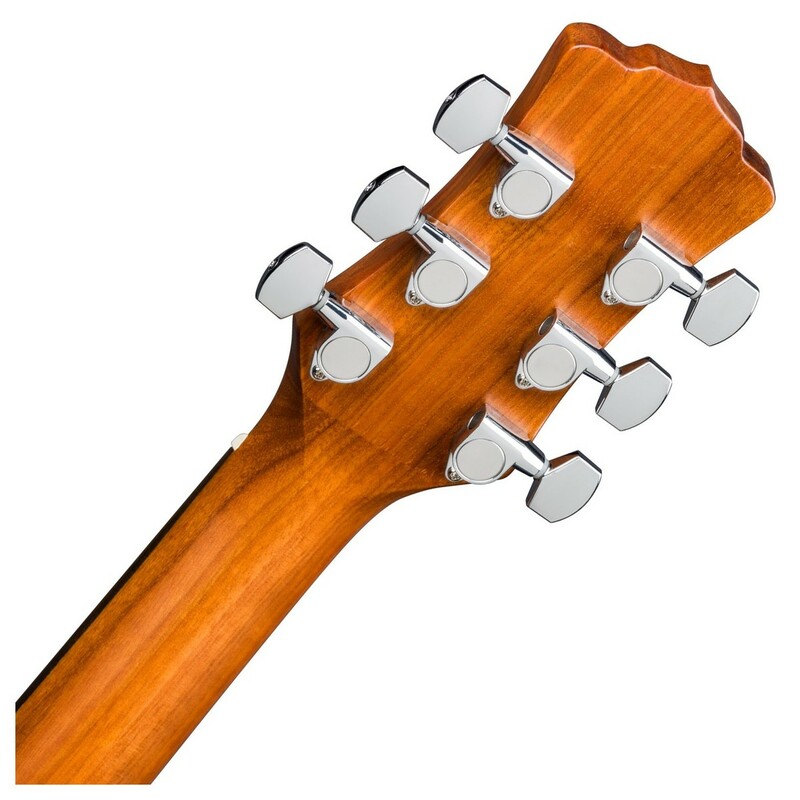 Mahogany is commonly used to craft guitar necks, as the wood responds greatly to numerous techniques with ease. To provide comfort, the Gypsy Henna features a C shaped neck profile, which offers players a comfortable and secure grip, reducing the likeliness of a cramping hand. 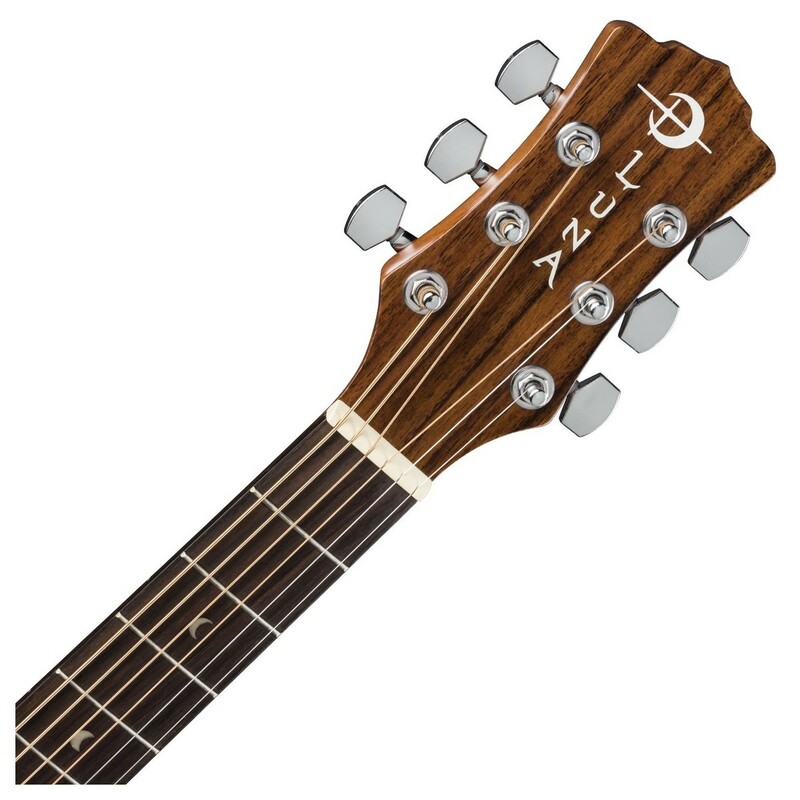 The neck is topped with a rosewood fingerboard that delivers a bright, warm, sizzling-sparkle that really shines through when playing fingerpicking techniques. Its rosewood fingerboard also provides a smooth and energetic playing experience and is sprinkled with stunning mother of pearl moon phase inlays, exclusive to Luna. The Gypsy Henna features a dreadnought body shape, which offers great projection and volume, whilst maintaining overall tonal balance. Its dreadnought body is better suited to players with a longer reach, and those more comfortable with bigger-bodied guitars. The Gypsy Henna delivers an overall well-rounded sound that can accommodate many different playing styles and genres with equal ease. The sheer volume the Gypsy Henna can project makes it ideal for the singer/songwriter, as vocalists can really push their diaphragm to the max without feeling too loud against the guitar's volume. Its dreadnought body is able to handle many different genres, making it versatile and ideal for students finding their playing style. Yvonne Villiers is an accomplished stained-glass artist who envisioned Luna guitars. Her inspiration for a line of guitars designed to maximise playing comfort came from her mother, Hilda Villiers, a bassist for over 40 years. Whilst watching her mum on stage, Yvonne couldn't help but notice the massive struggle her mum had whilst playing. With her mum being petite and using such a heavy instrument, she used to complain of how hard it was to be a woman and try to play these big bass guitars. Yvonne then questioned if there were others like her mum that struggled with the same problems and pains. She came up with the idea of a woman specific guitar, uniquely tailored to fit their bodies, their hands, and their musical styles. Yvonne moved on to created Luna guitars, a line of guitars made for female musicians of all ages and crafted with luminous visual beauty to engage women's minds and spirits along with their talent. Yvonne already had brilliant artistic skills and use of colour, she then applied the same techniques as she did with her award winning stained glass work to her new line of guitars. She is known for using rich colours that shimmer and shine with every movement providing an eye-catching design along with the great musical tones Luna guitars deliver. Yvonne's design expertise has led so many men to respond to Luna's well-crafted, spirit-engaging instruments that the company now creates guitars for both female and male musicians of all ages.